HealthFile Plus is your complete health and personal medical records and information organization software for Windows PCs, Palm OS handheld, and Pocket PC handhelds. Keep track of insurance, emergency contacts, allergies, illnesses, surgeries, appointments, medications, vaccinations, tests, blood pressure, weight, glucose, family history, and more! Great for people on diets, with diabetes, high blood pressure, etc. HealthFile Plus is your complete health and personal medical records and information organization software for Windows PCs, Palm OS handheld, and Pocket PC handhelds. Keep track of insurance, emergency contacts, allergies, illnesses, surgeries, appointments, medications, vaccinations, tests, blood pressure, weight, glucose, family history, and more! Great for people on diets, with diabetes, high blood pressure, etc. Topics in which to store information include: Personal - store basic personal information including birthday, address, normal health values. Legal - store organ donor status, will information, and other legal type items. Insurance - store information on all types of insurance; saves records to a master list for use in other profiles. Contacts - store emergency contact information; saves records to a master list for use in other profiles. 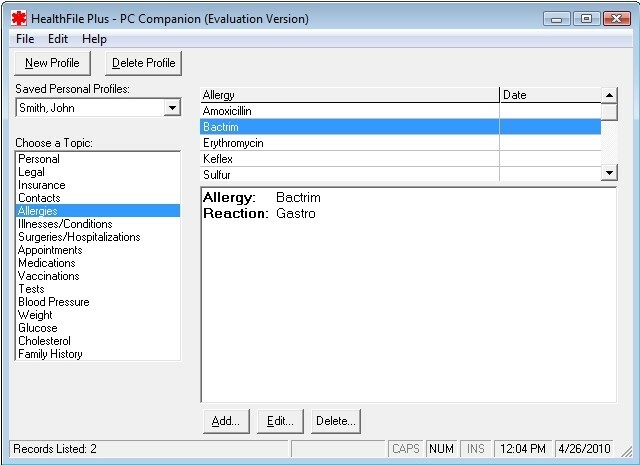 Allergies - store information on any allergies for the personal profile. Illnesses - store information on previous illness, diseases, or medical conditions including symptoms, diagnosis, treatment, etc. Surgeries - store information on previous surgeries or hospitalizations including date, instructions, etc. Appointments - store information on any appointment, including date, time, reason, diagnosis, follow-up date, etc. Medications - store information on medications or vitamins being taken, or previously taken, and prescription details. Vaccinations - store information on shots and vaccinations, including date, physician, etc. Tests - store information on any kind of test or exam, including result, goal, physician, location, etc. Blood Pressure - store blood pressure test results, including pulse, date, time, activity, etc. Weight - store weight measurements, including date, time, and notes. Glucose - store blood sugar test results, including carbs, date, time, event, etc. Family History - store family history information to record illnesses and conditions of related family members.